Don Clark CEO / Co-Founder Nate Goldenberg General Manager Momentum & Solitude Micah Staley General Manager Reection & Imagine Rob Groover Product Manager Solitude Peter Kinden Product Manager Reection Jerry McCarthy Vice President Service & Warranty OUR ALL-STAR TEAM CONTINUES TO RAISE THE BAR FOR THE INDUSTRY! 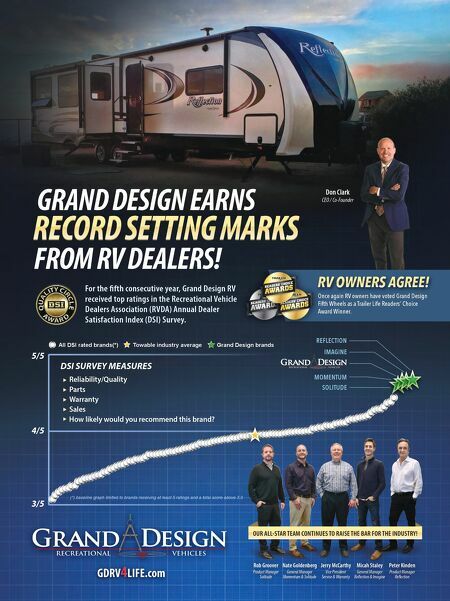 For the fth consecutive year, Grand Design RV received top ratings in the Recreational Vehicle Dealers Association (RVDA) Annual Dealer Satisfaction Index (DSI) Survey. 4/5 3/5 5/5 SOLITUDE MOMENTUM IMAGINE REFLECTION DSI SURVEY MEASURES Reliability/Quality Parts Warranty Sales How likely would you recommend this brand? 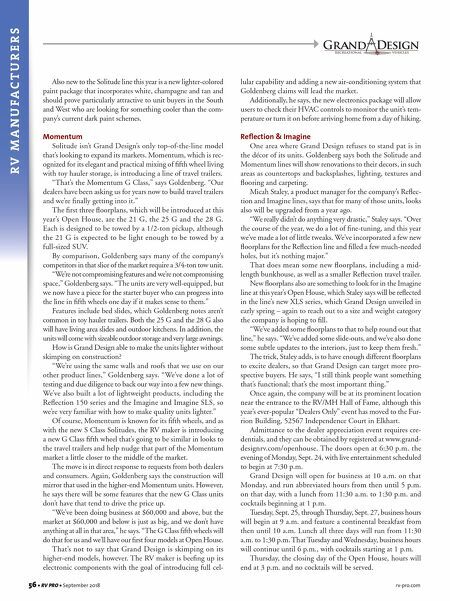 (*) baseline graph limited to brands receiving at least 5 ratings and a total score above 3.0 All DSI rated brands(*) Grand Design brands Towable industry average Once again RV owners have voted Grand Design Fifth Wheels as a Trailer Life Readers' Choice Award Winner.